I picked up Summer Will Show on my trip to Boston a couple of years ago. It caught my eye then because not long before we had run a good essay on Sylvia Townsend Warner in Open Letters. I’ve read most of the books from that trip but until now, not Summer Will Show. I think I put it off because I was expecting (its being historical fiction and all) something both dense and intense, like A Place of Greater Safety, say, or The Children’s Book (though obviously it’s much shorter — which should have been a clue). I was prompted to get to it at long last by notice that Anne Fernald was giving a talk about it at the New York Public Library. I wanted to attend the talk even before I read Summer Will Show, because I know Anne to be someone well worth listening to (see, for instance, her essays and reviews for Open Letters). Now that I’ve read the novel, I wish even more that I could have been there, because the novel seemed so strange to me that I could tell I needed some tips, some guidance about how it works, how it makes sense on its own terms. I actually enjoy that feeling of interpretive disorientation provided the book causing it feels interestingly confusing, not just blundering or messy. Vera Brittain’s The Dark Tide, for example, or anything I’ve read by Margaret Kennedy, would fall into that first category — and I wonder if it’s not coincidental that Summer Will Show is roughly contemporary with these novels and shares with them the property of being (for want of any other literary-historical label) “not modernist.” Not that I’m any kind of expert on reading modernism, but as far as I know there isn’t a handy set of terms or frameworks for making sense of the more miscellaneous fiction from the early decades of the 20th century. I read a number of very interesting books on topics like The Feminine Middlebrow Novel for the Somerville seminar, but Warner isn’t someone who came up — though her absence from my notes doesn’t mean that she isn’t actually mentioned in those sources, just that I wasn’t interested in her in that context. So even there I got no particular help. It may be best read along with other political fiction from the time (Orwell, maybe? ), but I don’t know much about that context. All I can really offer, then, are some provisional first impressions. My strongest initial impression is that Summer Will Show (again like The Dark Tide) is not an especially good novel, but that it’s bad in interesting ways. Duly acknowledging that “but is it any good?” is a fraught question, I’ll point out as weaknesses that neither of the main characters seemed quite three-dimensional to me: both were the literary equivalents of vivid but jerky puppets going through the motions of a story designed to lead to encounters and crises that, in their turn, were designed to bring about a conclusion more intellectual and ideological than human and dramatic. The story itself is at once simple and unexpected: aristocratic Sophia Willoughby travels to Paris in 1848 after the death of her children determined to find her straying husband and get pregnant again to make up for her loss; she finds him, as she intends, but instead of staking her claim, she falls in love with his theatrical Jewish mistress, Minna Lemuel, and as a result of their relationship is drawn into revolutionary fervor and ends up literally fighting on the barricades. Sophia is a supremely unappealing character — not just at the start (when her haughty prejudices are at their most dominant and unrepentant) but throughout. What Minna ever sees in her was one of my major stumbling blocks, while what she sees in Minna was another: their relationship comes from nothing and is never explained or described in any way that really motivates it. There’s another of the problems I had with the novel: it is jumpy and episodic, skipping over transitions where exposition would have been welcome and then becoming fulsome in contexts where great detail seemed gratuitous and digressive. The breathless rhythm of the sentences, the vivid tactile details, the repetitions, all add to the combination of urgency and predictability that makes the story so chilling: this is a catastrophe that has been long expected, even as its coming is painfully, hopelessly sudden. “No need, at this last door, to cry that the Christians were coming,” Minna says of her own frantic attempts to notify their neighbors. 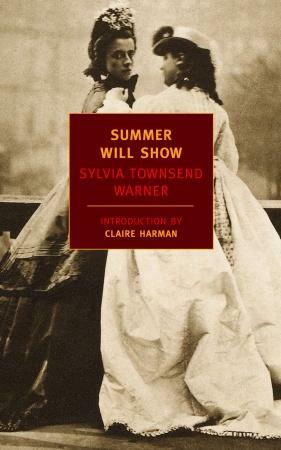 Summer Will Show earned my interest precisely because the writing is, generally, that good: I was captivated and impressed by Warner’s style even as the structure of the book frustrated me and the characterization disappointed. A book this well written can’t be simply careless, it isn’t inept: the awkwardness and the didacticism both felt purposeful. But what might that purpose be? According to the publicity notice, Anne’s talk focused on the novel as an exploration of “what might make a middle-aged person change her mind and her life–the very problem at the heart of politics. . . .what it might take to transform an imperious aristocratic wife into a communist.” In that context, I can see that Minna’s storytelling is important, not just because it sets up her individual identity, but because it draws our attention to the importance of the stories we tell about our experiences and those of others: changing your mind means changing your story, perhaps accepting someone else’s or incorporating it to create a more complex, multi-faceted narrative. I thought Sophia’s conversion from conservative to radical was too abrupt, and too idiosyncratically motivated by her passion for Minna, to be much of a model, but maybe it’s not her initial move into Minna’s life that really counts so much as her transformation at the very end of the novel, when her own experience of violent confrontation and its bloody consequences prompts a much deeper change. Certainly her speech before the firing squad is utterly and convincingly unlike anything the Sophia of the first chapters could ever say — and the Sophia who reflects with such pride on her meeting with the Duke of Wellington as the novel begins hardly seems the same person who concludes the novel reading The Communist Manifesto. But that’s where my dissatisfaction with the novel as a novel makes trouble for me again: the ending is a bit too pat. It felt as if the elements of the novel had been manipulated to ensure we ended up there, with the specter haunting Europe, rather than discovering the need for Marx as we read. Elizabeth Gaskell is a much more politically conservative thinker than Warner, but Mary Barton explains a lot more about socialism as a response to economic conditions than Summer Will Show — and no wonder, of course, since she was observing Manchester in the 1840s just as Engels was when he wrote The Condition of the Working Class in England.